ABSTRACT: Generalized spatial modulation (GSM) maps its information to the index of the transmit antenna combination, making simultaneous transmission of multiple symbol possible. However, SM outperform GSM scheme in terms of error performance of the same data rate, due to average power effect. Transmit and receive diversity or the combination of both allow huge improvement in mimo systems in terms of error performance. 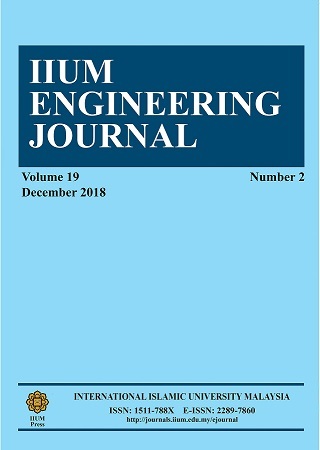 In this paper, we investigate a near optimal low-complexity Euclidean distance antenna selection (LC-EDAS) technique in GSM system, to further improve the performance of the conventional GSM system. The LC-EDAS technique independently search across signal and spatial dimension to eliminate the worse channel prior to transmission. Secondly, we investigate a sub-optimal low-complexity transmit antenna selection (LCTAS) in the GSM system to further reduce the computational complexity (CC) imposed by LC-EDAS. The Monte Carlo simulation results obtained reveals a trade-off between the GSM scheme with LC-EDAS and GSM scheme with sub-optimal transmit antenna selection in terms of error performance and CC. ABSTRAK: Modulasi Spatial Keseluruhan (GSM) menghubung informasi kepada indeks kombinasi antena yang dipancarkan, membuatkan pemancaran keseluruhan simbol dapat dilakukan. Walau bagaimanapun, SM lebih bagus daripada skim GSM pada prestasi kesilapan pada kadar data yang sama, kerana kesan purata kuasa. Kepelbagaian penghantaran dan penerimaan ataupun kombinasi keduanya memberi pembaharuan yang lebih besar dalam sistem mimo pada prestasi kesalahan. Penyelidikan ini akan mengkaji optima terdekat Euclidean kurang rumit, melalui teknik (LC-EDAS) pilihan jarak antenna dalam sistem GSM, bagi menambah prestasi sistem GSM sedia ada. Teknik LC-EDAS secara sendiri mencari signal dan dimensi separa bagi mengurangkan saluran lebih teruk semasa penghantaran. Kedua, kami mengkaji sub-optima proses pemilihan kurang rumit penyebaran antena (LCTAS) dalam sistem GSM bagi mengurangkan kerumitan pengiraan (CC) yang dikenakan oleh LC-EDAS. Keputusan simulasi Monte Carlo yang diperoleh menunjukkan timbangan antara skim GSM dan LC-EDAS dan skim GSM bersama sub-optima proses pemilihan penyebaran antena berdasarkan kesilapan prestasi dan CC. Simon M. K. (2010) Digital Communication over Fading Channels. Hoboken, Wiley-Interscience Publication. Goldsmith A. (2005) Wireless Communications. Cambridge, Cambridge University Press. Mesleh R. Y, Haas H, Sinanovic S, Chang Wook A, and Sangboh Y. (2008) Spatial Modulation. IEEE Transactions on Vehicular Technology, vol. (57): pp. 2228-2241. Younis A, Serafimovski N, Mesleh R, and Haas H. (2010) Generalised Spatial Modulation. In Proceedings of Conference Record of the Forty Fourth Asilomar Conference on Signals, Systems and Computers, November 7-10, 2010; Pacific Grove, California. Edited by Michael B. Matthews, ATK Mission Research; pp. 1498-1502. Mesleh R, Ikki S. S, and Aggoune H.M. (2014) Quadrature Spatial Modulation. IEEE Transactions on Vehicular Technology, vol (64): pp. 2738-2742. Mesleh R, and Ikki S. S (2014) A High Spectral Efficiency Spatial Modulation Technique. In Proceedings of IEEE 80th Vehicular Technology Conference, 14â€“17 September 2014; Vancouver. Jintao W, Shuyun J and Jian S. (2012) Generalised Spatial Modulation System with Multiple Active Transmit Antennas and Low Complexity Detection Scheme. IEEE Transactions on Wireless Communications, vol (11):pp. 1605-1615. Rajashekar R, Hari K. V. S and Hanzo L. (2013) Antenna Selection in Spatial Modulation Systems. IEEE Communications Letters, vol. (17):pp. 521-524. Xu H, Naidoo N.R, and Quazi T. (2010) Spatial Modulation: optimal detector asymptotic performance and multiple-stage detection. IET Proceedings - Communications, vol. (10):pp. 1368 â€“ 1376. Xu H, Pillay N. (2014) Low Complexity Detection and Transmit Antenna Selection for Spatial Modulation. SAIEE Africa Research Journal, vol(105):pp. 4-12. Yang P, Guan Y. L, Xiao Y, Di Renzo M, Li S, and Hanzo. L (2015) Transmit Pre-coded Spatial Modulation: maximizing the minimum euclidean distance versus minimizing the bit error ratio. IEEE Transactions on Wireless Communications, vol. (32):pp. 1-15. Yang P, Guan Y. L, Xiao Y, Li S, and Hanzo. L (2016) Transmit Antenna Selection for Multiple-Input Multiple-Output Spatial Modulation Systems. IEEE Transactions on Communications, vol. (64): pp. 2035-2048. Di Renzo M, and Haas H. (2010) Improving the performance of space shift keying (SSK) modulation via opportunistic power allocation. IEEE Communications Letters, vol. (14): pp. 500-502. Yang P, Xiao Y, Di Renzo M, Li S, and Hanzo. L (2015) Design Guidelines for Spatial Modulation. IEEE Communication Surveys and Tutorials, vol.(17):pp. 6-26. Xu H, Pillay N. (2015) Low-Complexity Transmit Antenna Selection Schemes for Spatial Modulation. IET Communications, vol.(9):pp. 239-248. Nan W, Wenlong L, Hongzhi M, Minglu J, and Hongjun X. (2014) Further Complexity Reduction Using Rotational Symmetry for EDAS in Spatial Modulation. IEEE Communications Letters, vol. (18): pp. 1835-1838. Ping Y, Yue X, Lei L, Qian T, Yi Y, and Shaoqian L. (2012) Link Adaptation for Spatial Modulation With Limited Feedback. IEEE Transactions on Vehicular Technology, vol. (61): pp. 3808-3813. Ntontin K, Di Renzo M, Perez-Neira A. I, and Verikoukis C. (2013) A Low-Complexity Method for Antenna Selection in Spatial Modulation Systems. IEEE Communications Letters, vol. (17): pp. 2312-2315. Xu H, Pillay N. (2016) Improved Generalized Spatial Modulation via Antenna Selection. International Journal of Communication Systems, vol. (30). Zhou Z, Ge N, and Lin X. (2014) Reduced-Complexity Antenna Selection Schemes in Spatial Modulation. IEEE Communications Letters, vol. (18): pp. 14-17. Jianping Z. (2012) Signal Vector Based List Detection for Spatial Modulation. IEEE Wireless Communications Letters, vol. (1): pp. 265-267. Xu H, Pillay N. (2013) Comments on Signal Vector Based Detection Scheme for Spatial Modulation. IEEE Communications Letters, vol. (17): pp. 2-3.